You may have noticed that your iPhone hi-fi system doesn’t work too well with your iPad. Basically the adpators are incompatible. So there was clearly a gap for an enterprising manufacturer to come up with a solution to this. Step forward WireFreeHiFi and its Airphonic system. It comprises a pair of dongles, one that attaches to your iPad/iPhone and the other to the docking station. 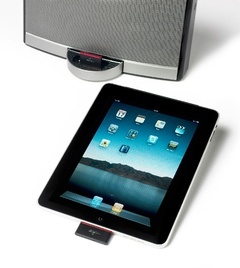 You then pair them up and voila you are are able to stream music from the devices to your hi-fi system. The Airphonic uses Kleer wireless audio technology, which its maker claims is better than Bluetooth and delivers full CD quality, with no drop-outs on music and no interference. Users apparently have full streaming, remote volume and track control at up to 10 metres line of sight. The system obviously also works with Spotify and Last FM as well as music you have stored on Apple devices. It is available in two versions – one for the iPad and iPod for £79.95 and another which adds iPhone compatibility for a tenner more.